Driving Direction from Brenner: Go south on the highway for 50 km and take the Klausen exit. 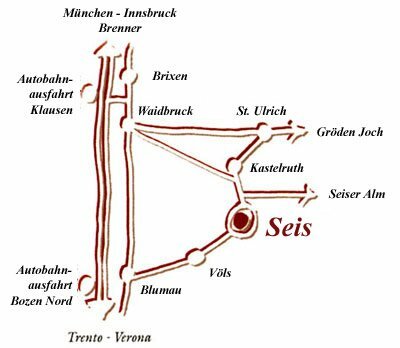 From Klausen take the interstate for 10 km toward Bozen, turn left in the direction Waidbruck. DirectionWaidbruck leads to Schlerngebietin only 10 minutes. Directions from the South: Get of the highway at Bozen Nord. Take the interstate in the direction of Brenner. In 5 km you will reach Blumau, here turn towards Schlerngebiet (CAUSTION: take the left tunnel, not the right!). You should reache Völs within 15 minutes at the point. Pass Völs and in only 5 minutes you will reach Seis. If you come by train or by bus, we will happy to pick you up either the station in Bozen or Klausen. There is a new Aiport in Bozen and we will also be available to pick you up from there.